We knew Ryan and Jax were a fun-loving pair the moment their wedding gift design landed in our inbox. These two used the design-your-own tool on the Marigold & Grey website, and we could tell immediately this event of theirs was going to be a blast! The tool is useful. 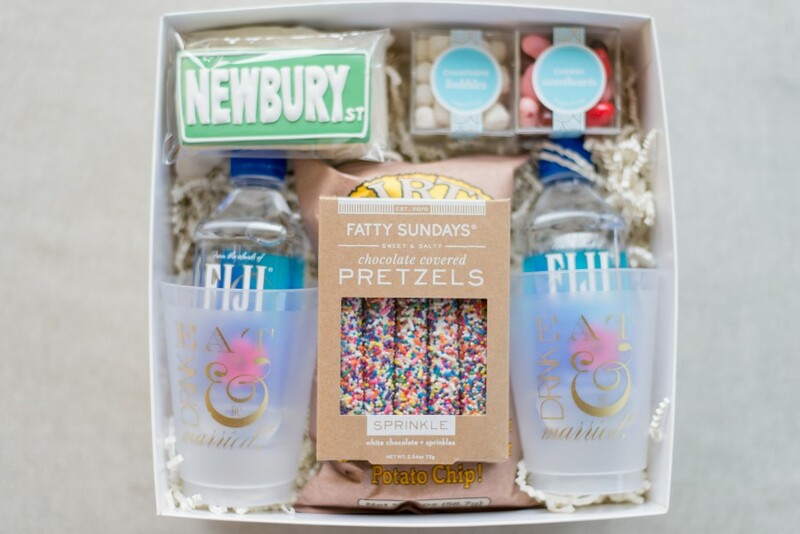 Clients can customize their own welcome gifts by choosing from a selection of carefully curated items including packaging options, edibles, beverages, keepsakes and finishing touches. We learned immediately that J+R adore color and sweets (the best combination! ), so we can only imagine the thrill guests had when opening their gift boxes. The bright pops of color began with the packaging. Ryan and Jax chose to use our high gloss white box. 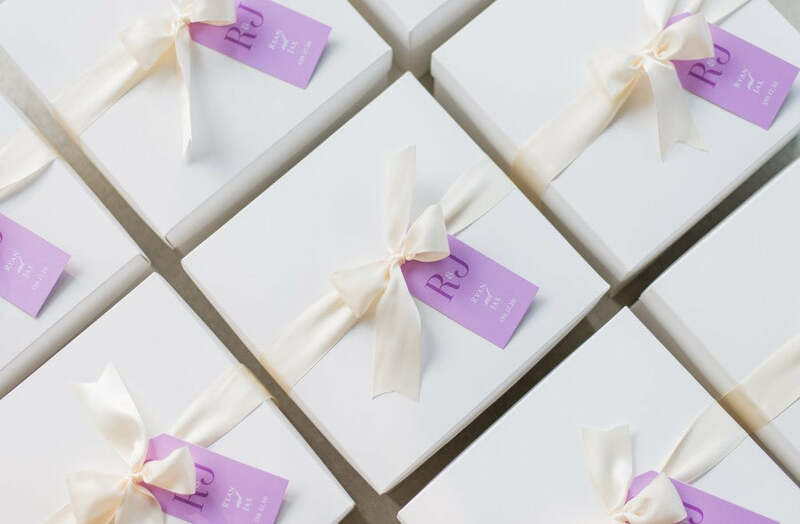 An ivory ribbon kept all of the contents safely inside, plus the couple paired the box and ribbon with a lovely purple gift tag complete with their names. When using the design-your-own-gift tool, all of these options can be easily with a few clicks and very easily your welcome gifts are complete. Inside, guests were greeted with a host of treats! R+J were careful to mix sweet and salty options together. 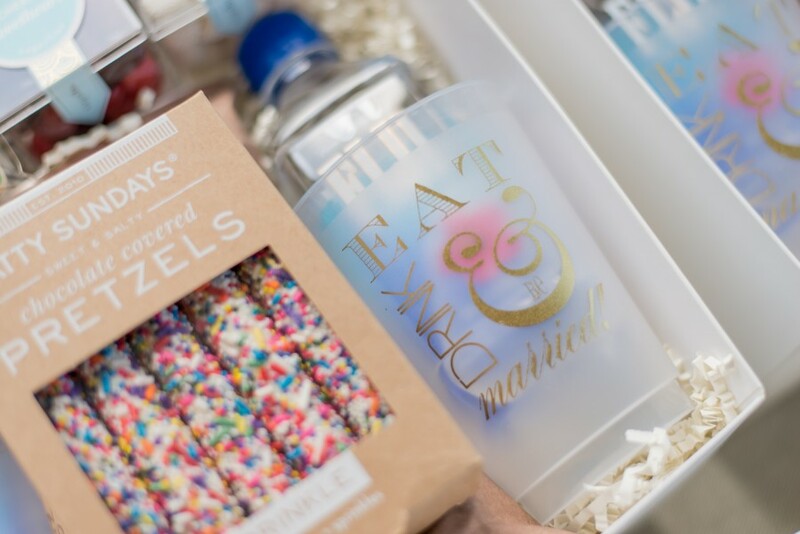 The Fatty Sundays chocolate covered pretzels were the first thing to catch each guest’s eye, and it’s safe to say we would have opened them immediately had we been the recipients. The sprinkles are just so fun! 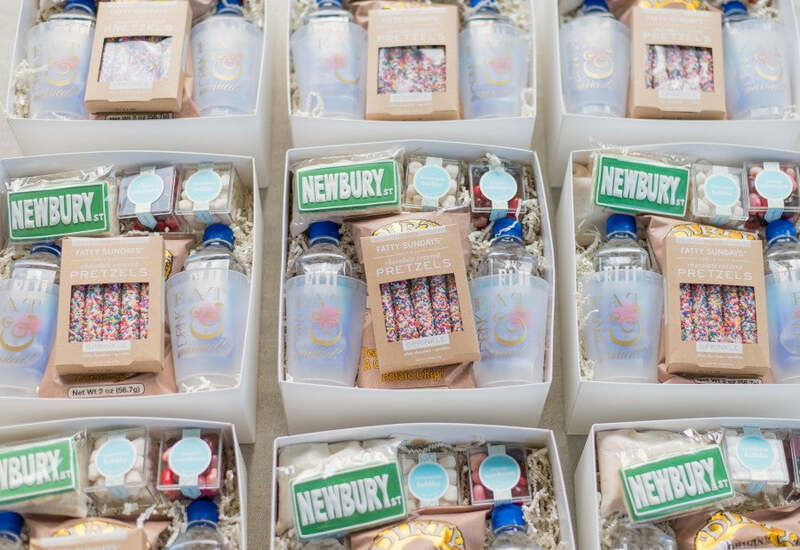 Plus, Champagne Bubbles and Cherry Sweethearts candy cubes from Sugarfina were also included. Route 11 potato chips too! 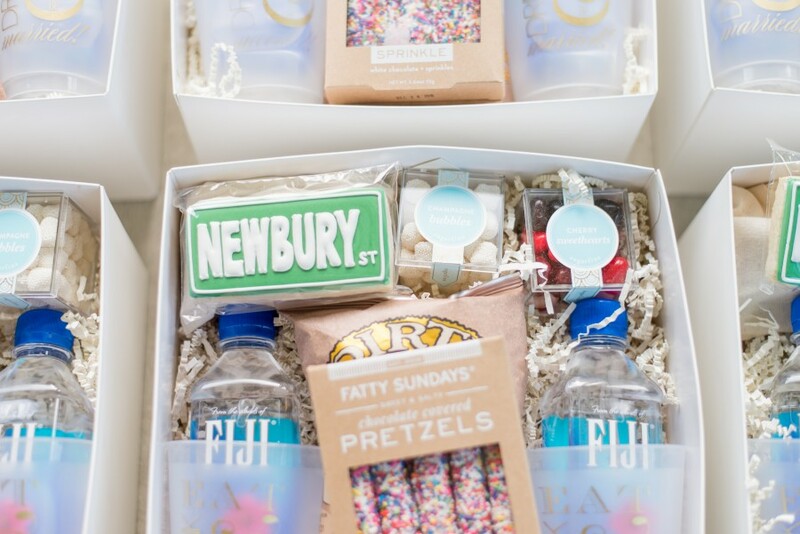 Two bottles of Fiji water were added into the mix with two adorable “eat, drink, & be married” custom cups. The obvious highlight of Ryan and Jax’s welcome gifts was the Newberry Street cookie! The pair share a love for Boston, the city where they hosted their wedding, and we adore this standout detail. Nestled underneath the cookie was an amenity kit carefully packaged in a drawstring bag...such a useful surprise! R+J, your gifts undoubtedly set the stage for what we can only imagine was the liveliest event of the season! For more information about our custom gift design service, please email us via hello@marigoldgrey.com.